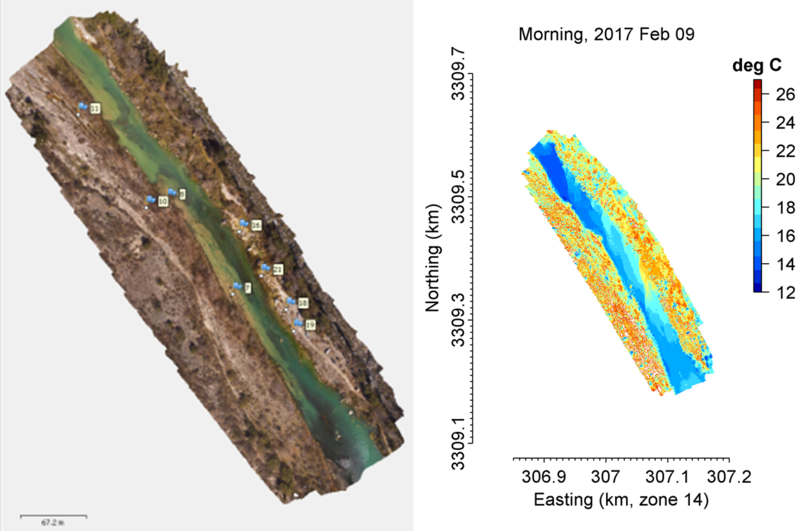 In support of Dr. Ron Breitmeyer (UNR) AirCTEMPs is providing time-series UAS data leading to high-resolution digital elevation models (left, 1 cm/pixel and better than 4 cm vertical accuracy) that are expected to quantify geomorphic changes to mine waste dumps and the adjacent drainage channel. 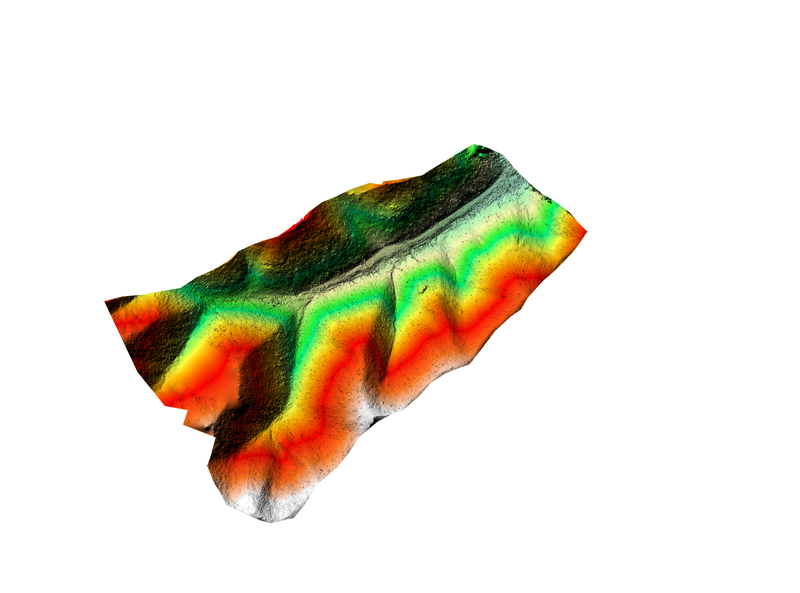 Hyperspectral imagery are also being acquired and analyzed to yield acidic rock-soil index maps. The project will be completed by the summer of 2020. In collaboration with Christa Kelleher (Syracuse University), AirCTEMPs is examining potential groundwater-surface water interactions from derived water surface elevations and riparian vegetation distributions. 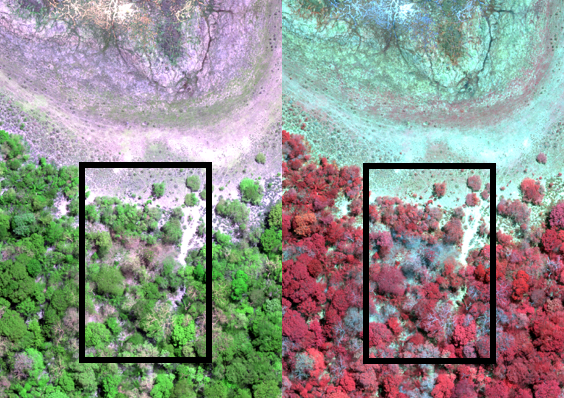 Stitched visual RGB imagery (left) and NDVI (right) within Micasense Atlas web portal. 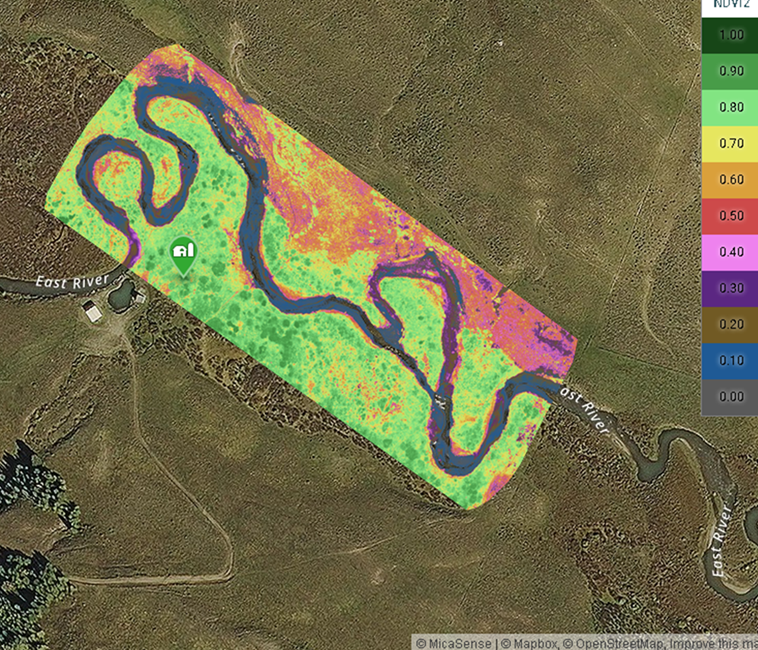 Red indicates low NDVI (~0) and dark blue represent higher NDVI. 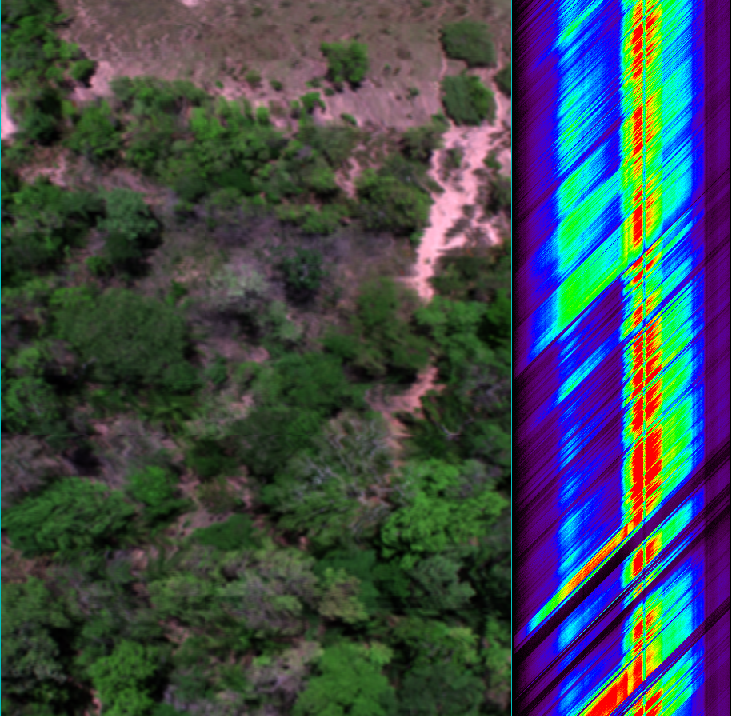 In collaboration with Kenneth Williams (LBL), Dana Chadwick (Stanford), Benjamin Blonder (University of Oxford), and Christopher Still (OSU), AirCTEMPs is examining multi- and hyper- spectral bands for vegetation classification. 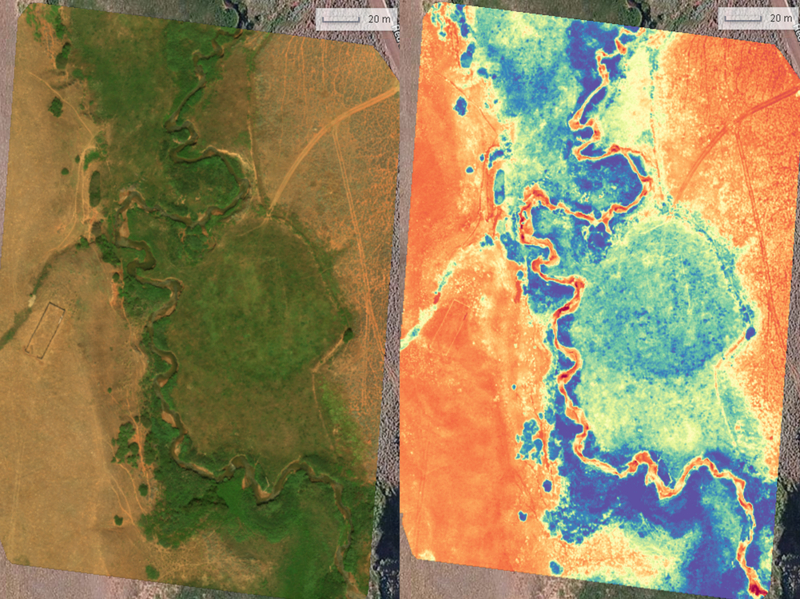 Stitched visual RGB imagery (left) and NDVI (right) within Micasense Atlas web portal. Red indicates low NDVI (~0) and dark blue represent higher NDVI. 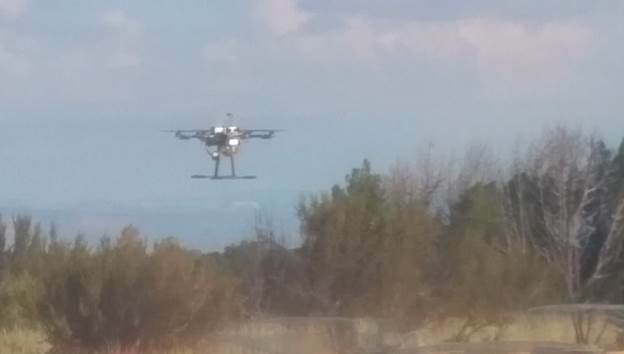 AirCTEMPs is assisting Dr. Paul Verburg (UNR) by remotely monitoring crop production approximately once a month using a Micasense RedEdge camera mounted on a small drone as part of a project assessing the use of alternative, salt-tolerant, crops to allow for use of saline soils while providing economic benefit. To meet this objective, Dr. Verburg and his team are conducting field trials at Main Station Field Lab, a property east of Reno/Sparks owned by the University of Nevada, Reno with multiple crops including Quinoa, Amaranth, and AC Saltlander Green wheatgrass. 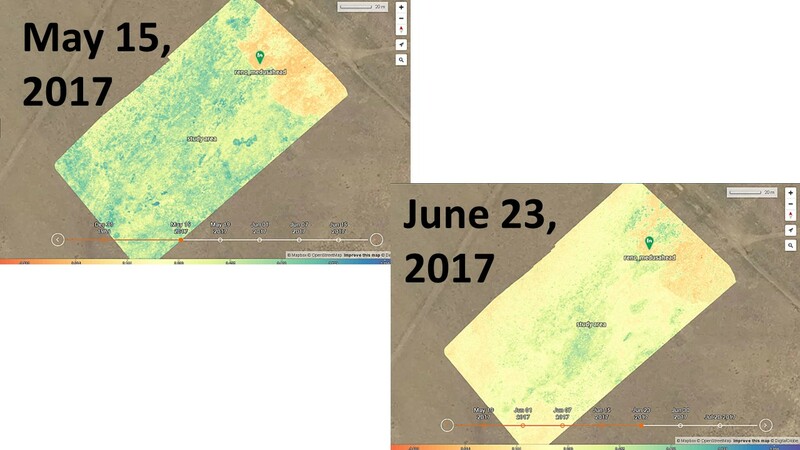 In addition to the remote monitoring, soil moisture, temperature, and salinity are being continuously monitored at 20 locations at the field site. In collaboration with Dr. Peter Weisberg and the Great Basin Landscape Ecology Lab (UNR), AirCTEMPs is investigating remote detection and discrimination of invasive medusahead (Taeniatherum caput-medusae) based upon phenological and structural differences at fine spatial scales. 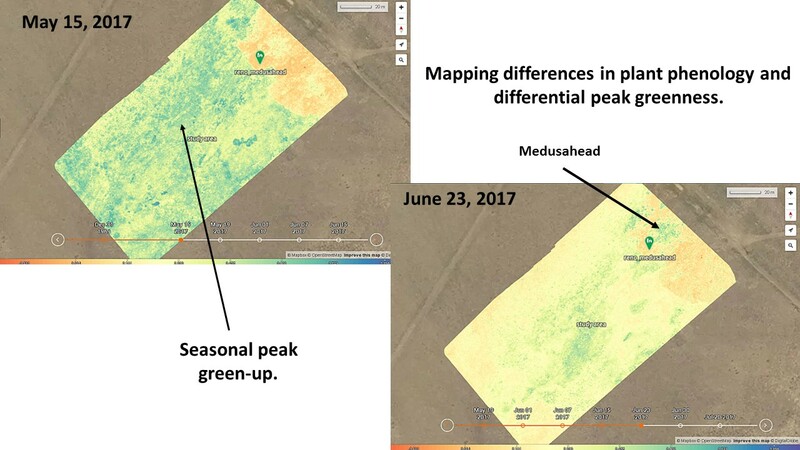 AirCTEMPs flew nine multispectral UAS missions during May – July, 2017 over a study covered by native vegetation and patches of medusahead. Data analysis will be completed during the summer of 2018. 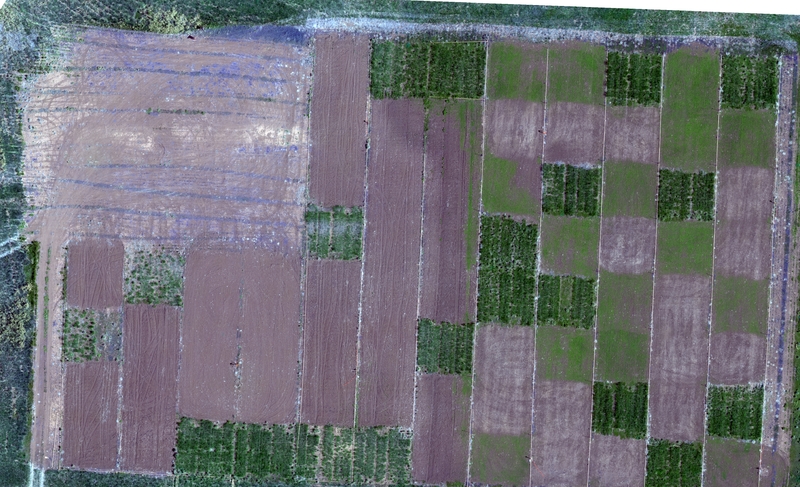 In collaboration with Thanos Papanicolaou (UT Knoxville), AirCTEMPs is examining microtopography from different farm tillage practices and subsequent hydrological processes. 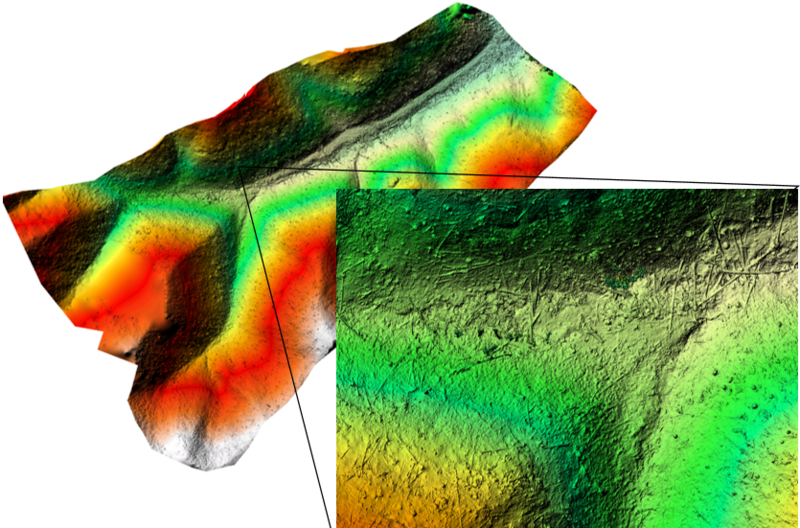 Stitched visual RGB imagery (left) and digital elevation map (DEM, right). The data shows sub-cm resolved DEM. 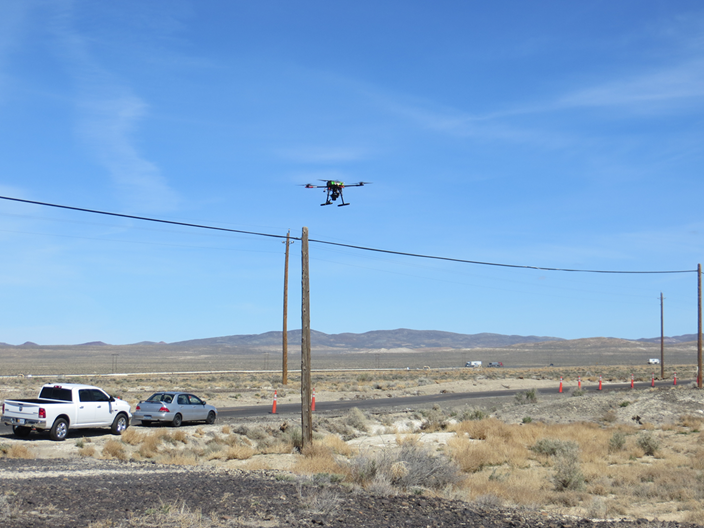 In collaboration with Jessica Lundquist (UWash) and Adrian Harpold (UNR), AirCTEMPs is examining multi-resolution thermal imagery (point to satellite) for snow coverage in Sagehen, CA. Stitched visual imagery overlaid in Google Earth Pro (left) and thermal imagery (right). NA values were denoted as zero. Warm areas correspond with tree and bare ground. In collaboration with Todd Caldwell at UT Austin, AirCTEMPs is examining groundwater-surface water lateral and vertical mixing using thermal signatures. 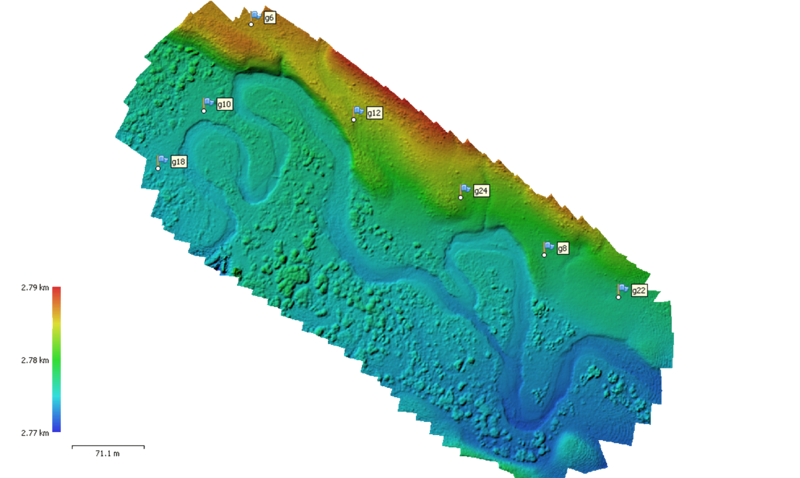 sUAS thermal imagery was coupled with (non-CTEMPS) DTS strung along the thalweg riverbed. Stitched visual imagery in Agisoft Photoscan (left) and thermal imagery (right). Thermal imagery clearly indicates warm spring inlet. 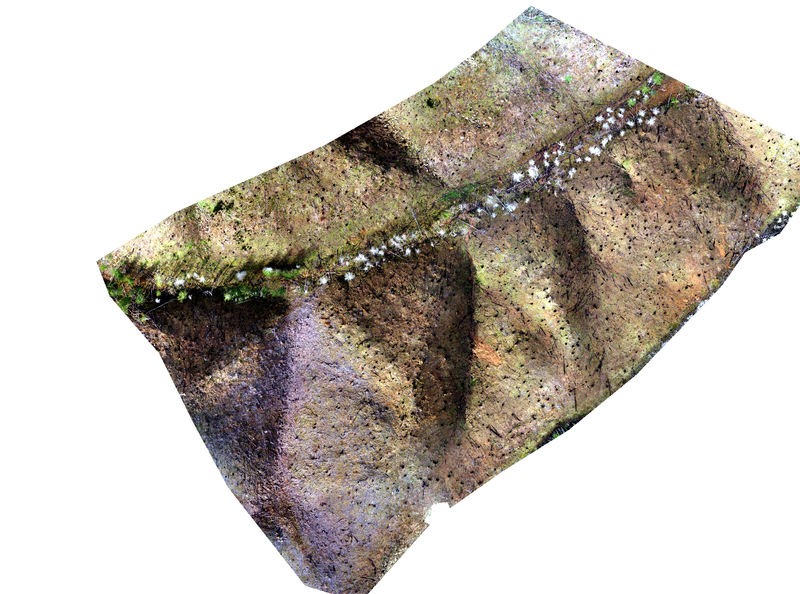 In collaboration with Danica Roth at University of Oregon, AirCTEMPs measured topographic roughness (microtopography) on a recently burned hillslope in Roseburg. This data will be used to (1) compare different metrics for quantifying topographic roughness and (2) evaluate the impact of topographic roughness on particle travel distances during sediment transport. Vineyards face many challenges to productivity including those from viruses. AirCTEMPs is investigating the use of multispectral imagery to detect virus presence in vineyards before it is visible to the human eye. The goal of this research is to determine whether this approach will lead to greater expediency in identifying and isolating this threat. We have begun a series of multispectral flights in infected vineyards and will continue these throughout the growing season in 2017. 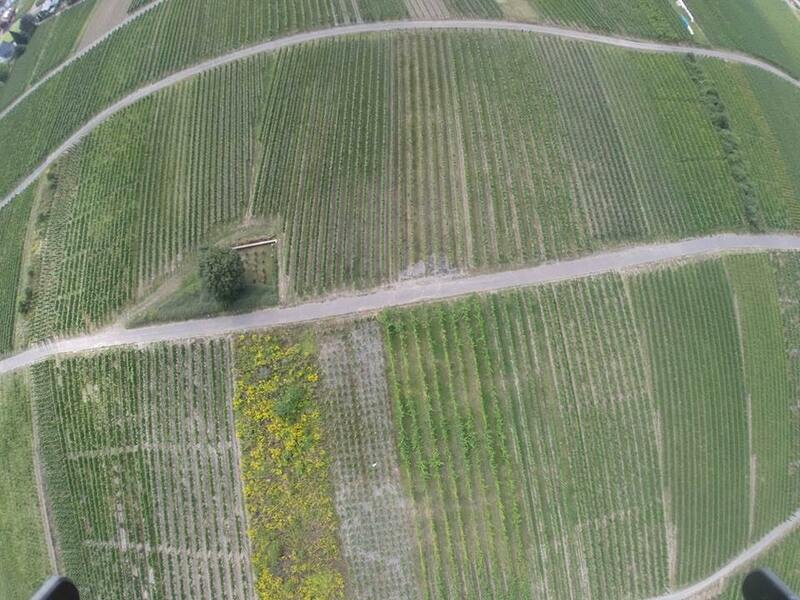 Our aerial imagery will be analyzed in conjunction with ground samples of vines that are taken during the flight. AirCTEMPs participated in a Consortia of Universities for the Advancement of Hydrologic Sciences (CUAHSI) short course focused on groundwater/surface water interactions held on the East River near Crested Butte, CO in the summer of 2016. Flying our Storm AntiGravity and Phantom 3, we developed a high resolution digital elevation model of the 400x300m field site. Near IR imagery was flown over the entire site and clearly showed areas of high vegetation density where expect to see groundwater exchange. In the video, you can see the high resolution Electrical Resistance Tomography lines being put in across the stream, and also the injection of the Rasazurin tracer used to document aerobic respiration. This week long short course hosted ~25 students and was taught by faculty from the Colorado School of Mines, the University of Colorado, University of New Mexico, University of Nevada, Reno and the U.S. Geological Survey. 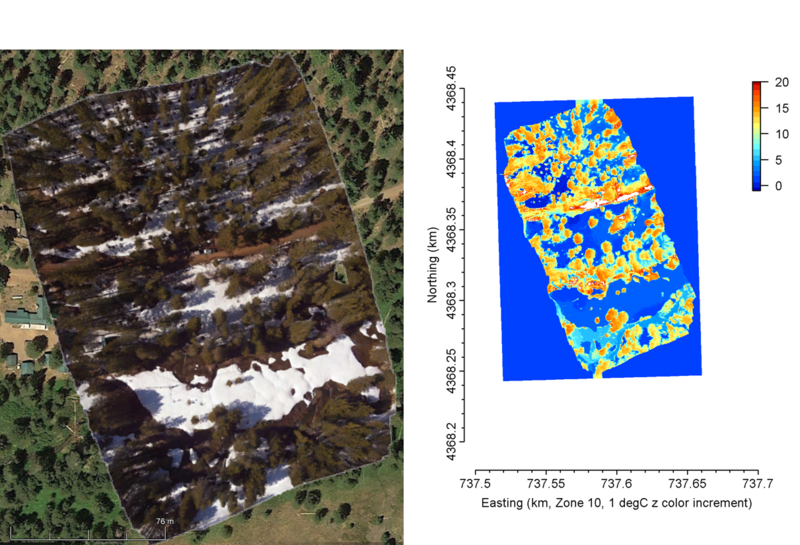 In collaboration with another NSF-funded team, Kristen Waring at NAU that is investigating climate change impacts, Chris Still and AirCTEMPs collected thermal and five-band imagery over tree seedling plots in Arizona and Oregon. These measurements are being analyzed in coordination with extensive ground samples of tree canopy features. This project will continue over a five-year period to investigate local and regional impacts of climate change on coniferous forests. In collaboration with Kurt Fiegl of UW-Madison, AirCTEMPS conducted a pilot study to examine the feasibility of assessing fine-scale (cm level) elevation change between two dates 14 days apart at a geothermal site near Brady Hot Springs. 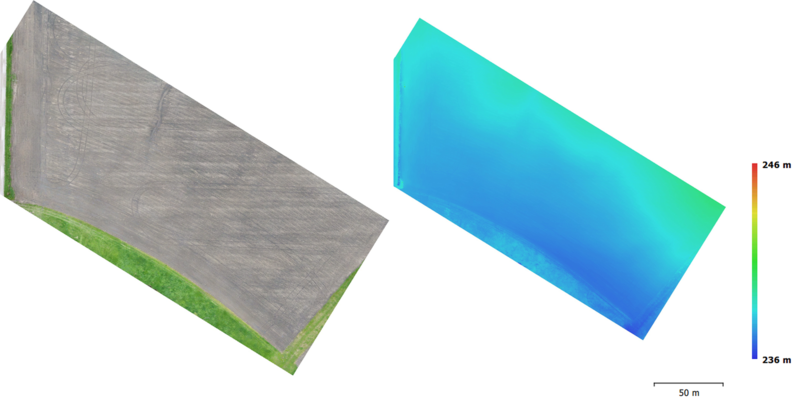 The AirCTEMPS crew surveyed 700 sq meters at an 8 mm ground sampling distance using photogrammetry and 16 ground control points. Photogrammetry data was collected using a gimbal stabilized Sony A5100 camera with a 20 mm fixed focal length lens onboard a customized Tarot 650 quadcopter. 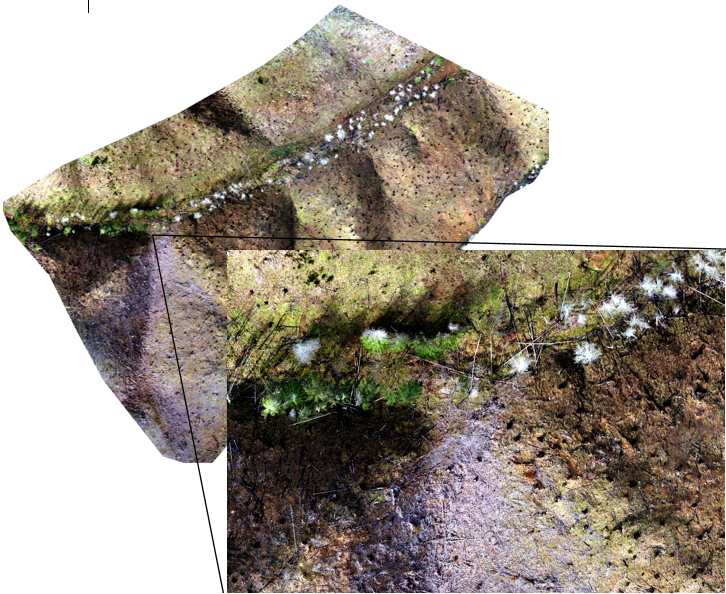 All image processing of photogrammetric data was conducted using Agisoft Photoscan. Taiman Foundation in Mongolia supported UNR AirCTEMPs' first deployment: testing of aircraft for conducting fish surveys. 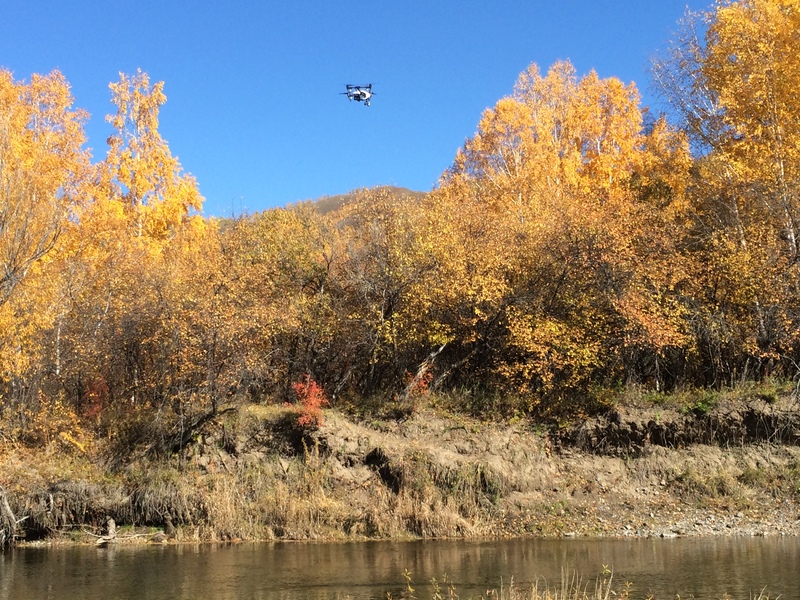 While using low-cost video imaging, fish counts of the world’s largest trout, the Taiman, were shown to be possible from sUAS on the Eg River in northern Mongolia. Using a search and rescue pattern, Taiman were identified in video imagery, and sized using on-shore reference scales. In collaboration with Heather Holms from University of Nevada-Reno, and Michael Wing from Oregon State University, we set up a tower with 4 IRGASONS. 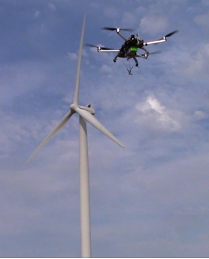 Then we proceeded to suspend a Distributed temperature sensing (DTS) fiber optic cable from a UAS to measure a detailed temperature profile in front and behind a wind turbine. These data will help unravel existing mysteries about stable atmospheric boundary layer dynamics, and tease out the possible impact of wind turbines on the local micrometeorology.